Checkout our gin labels here. We love your business name, tell us your thinking behind this. Well, in the early days we were working on the gin recipe in the kitchen when suddenly an incident with the paraffin caused the kitchen to fill with smoke and we were banished to the garden to continue our experiments. It only seemed right this was part of the theme. However, on a more serious note we are also very aware of being eco and environmentally friendly and we wanted this to be reflected in our product name. 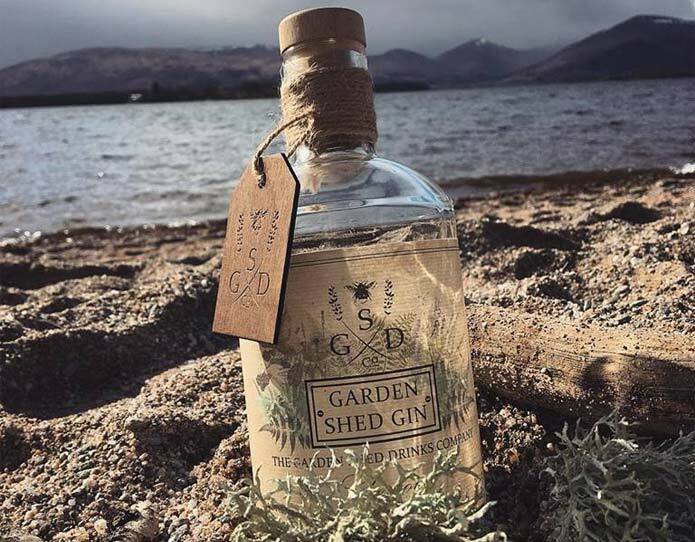 Our gin, Garden Shed Gin, also takes ingredients from the garden with blackberries, lavender and dandelion so realistically there were quite a few different reasons behind calling it The Garden Shed Drinks Company. Tell us a little more about the product. Garden Shed Gin is an award-winning London Dry style gin packed full of florals and spices. It is best served over plenty of ice with a classic tonic and garnished with a sprig of freshly picked rosemary and a blackberry. We have only been running as a business since December last year and it is going much better than we ever expected. We are continually thinking about and working on new ideas and recipes and plan to make more gins and possibly a rum in the future. Gin has had a real revolution over recent years, how do you make sure your products stand out amongst others in the market? Our aim is to produce gin in the most environmentally responsible way whilst donating a portion of our profits to two local charities; Trees4Scotland and The Bumblebee Conservation Trust. We love using our hashtag #plantingtreesandsavingbees and for every six bottles of gin that we sell, we plant a tree and give a proportion of our profits to saving bees. Our idea is that we will eventually have a GSDCo. forest and a field that is full of beehives. These beehives will be managed in partnership with the Scottish Bee Company and we aim to use the produce from the bees in future products. In terms of taste, our gin has more of a florally, earthy garden-based flavour since we use grains of paradise instead of coriander seeds. The WePrint team love your label design, tell us your inspiration when creating it. The branding came first which shows our love for nature. It combines sprigs of lavender and a bee in the centre and reiterates how we take from and give back to nature. It was important to create a brand which stood out on the shelf but also reflected our passion. So many labels these days are modern and clean-looking, but ours is rustic. Our thinking was to create a brand, label and bottle that wouldn’t look out of place in a shed. How important is the packaging when selling a product like yours? The packaging on a product is very important. It is also vital for us to have a really high-quality product which is a reflection of our company. We aim to be the best we can, whilst also doing our best for the environment. It is important to us that our packaging is recyclable too. Tell us three things you think are vital to include in an exciting label design. The logo, your brand and artwork help to tell the story of your product. Making sure that the imagery encapsulates the brand is key! What do you love most about running this business? It’s fun! There are four of us involved – myself and my husband Ruaridh and then our best friends Maxine and Ryan. Business meetings usually revolve around food and drink whilst we brainstorm new ideas. We are all quite creative and full of ideas, so turning an idea into a reality is pretty cool! If people want to learn more about your products where should they look? Head to our website at https://thegardensheddrinksco.com/ and find us on Facebook, Instagram and Twitter.